Not everybody wants a modish ball gown. 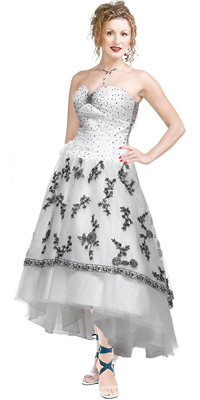 Some also prefer a ball gown that looks more retro. This dress is retro inspired. The designs and the pattern looks so much from the 70s but with a little bit of contemporary touch. The sweetheart neckline and the bust have a combination of beads and ruche. The skirt is gathered and runs till the ankle. The back has a unique and pretty bow tie-up that adds a feminine touch.